Is this the most posed photo you’ve ever seen? Two blokes trying to look exhausted and asleep with big grins on their faces! 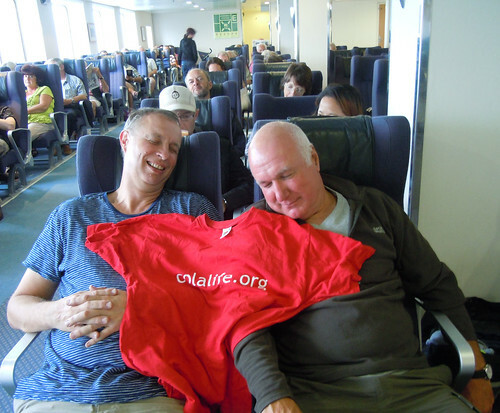 This is Bill (left) and Nigel (right) on the ferry from Le Havre to Portsmouth after their 400 km ride across the north of France from Dinard to Deauville (D2D) for ColaLife. The 4-day ride was undertaken almost exclusively in the rain but apparently spirits ran high. I am very pleased to say that Nigel and I made it back to the UK last night on the 5pm ferry from Le Havre. We reached our 400 kilometre target in Le Havre and had a thoroughly enjoyable and tiring four days despite the rain. The bike is now in the back of the shed – not to be used for a few weeks!! PS – sitting down seems to be a little bit uncomfortable at the moment but hopefully this will improve!! Huge thanks go to Bill and Nigel for organising this ride and following it through and raising money for ColaLife in the process. 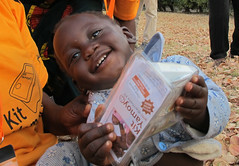 Offline donations are still coming in and they expect to raise £2,750. This money is going towards the costs – mostly travel – of following up leads we have in Tanzania, South Africa and Uganda to get activity underway on the ground in these countries. 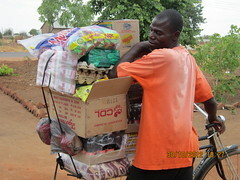 It was last year’s ride that raised the money for the visits to Zambia to co-design the trial and produce a costed plan. We are fairly confident that we will be successful in raising the $1.35million needed to run the trial. We effectively multiplied last year’s ride sponsorship by 84 to get the money we need for the trial. We are going to do our best to do a similar thing again with the proceeds of this year’s ride.